This salad is light, refreshing, and so easy to make! Start with fresh greens (I used a mix of romaine lettuce and mixed greens), add other vegetables-I love cucumbers, grape tomatoes, red bell pepper, mushrooms. 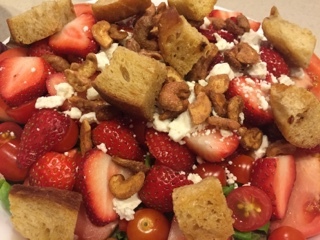 Add feta cheese for a nice tangy flavor to off-set the sweet of the strawberry and candied nuts. Add candied nuts and croutons. Top with your favorite light dressing. I love balsamic vinegar, olive oil, salt and pepper. The balsamic vinegar works nicely with the strawberries and feta cheese. -mix about a half cup brown sugar with a table spoon of water. (Add more water to loosen) Add about 1/4 tsp cinnamon. Stir. Drizzle mixture over nuts and toss lightly. -Cut bread (Sourdough, roasted garlic, anything thick with work best) into bite sized pieces. -Bake at 250 degrees for 30 minutes or until the bread is toasted and dry. -I sometimes add roast chicken (from Costco-can't beat the flavor, convenience, or the price!) Grilled shrimp is also amazing with this refreshing and tasty salad.